When and where did history begin? When was the genesis of civilisation in Egypt? How and why were the Great Sphinx and the three pyramids of Giza designed to serve as pasrts of an immense three-dimensional model of the sky of 'First Time'? What is contained in the rectangular chamber that seismic surveys have located in the bedrock far below the paws of the sphinx? What lies behind the mysterious doors recently discovered at the end of a previously unexplored shaft inside the Great Pyramid? And does mankind have a rendezvous with destiny - a rendezvous not in the future, but in the distant past - at a precise place and time? Using sophisticated computer simulations of the ancient skies to crack the millenial code that the monuments transcribe, Bauval and Hancock set out a startling new theory concerning the Pyramid Texts and other archaic Egyptian scriptures. 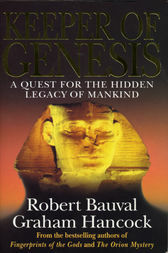 "The book reads like a detective story, with the reader enthusiastically trying to outguess the writers"
Robert Bauval is a construction engineer with a long-standing interest in the astronomy of the pyramids, having lived in Egypt and elsewhere in the Middle East for much of his life. The Orion Mystery was his first book. Graham Hancock is a former East African correspondent for The Economist and has travelled widely around the world. He is the author of Fingerprints of the Gods, The Sign and the Seal and Lords of Poverty.